I know that many of you are fans of the Paleo diet. Myself, I try not to subscribe to any particular diet, choosing rather to adopt principals which I agree with and which I think work best for me. Sticking with Bruce Lee’s principles behind Jeet Kune Do, I prefer to take what I perceive as the best of all of the “styles”, and fashion that collection of principles into my own style. I wanted to share this link due to the fact that I think the article has some interesting points that I happen to agree with as far as the various benefits that the Paleo diet offers; benefits which the diet has helped bring to peoples attention. I especially agree with points 1, 3 and 8. These are all things that I have incorporated into my day-to-day, and which have helped me along my journey thus far. What are your thoughts on the Paleo diet? Are you a committed believer? Have you adopted just a few of the aspects? Are you not sold on it? Let me know! My last four weeks have been some of the most eventful of my entire life. Two and a half weeks ago, I started this blog, and with the help of each of you that are reading this, I consider it a success. Three weeks ago, I completed my first major project after 15 months of blood, sweat and tears, and put my stamp on a piece of the construction industry that no one will ever be able to take from me. One month ago tomorrow, I quit my two-pack-per-day habit cold turkey after waking up in the middle of the night craving a cigarette. The same day I decided to quit smoking is the same day I made the commitment to change my eating habits and to begin, ‘Going Blue’. Sitting here on the cusp of what I’ll consider a milestone (one month), I’m taking some time to reflect on where I am and what I’ve done. While I will spare you all of the daily miscellaneous victories and defeats, one thing I do need to say is this: without a shadow of a doubt, it has been harder for me to change my eating habits by eating healthier foods as well of less food in general, than it has been for me to quit smoking. Even today, I got angry (hangry) on the way home from work, because all I wanted to do was drive straight to the corner pizza joint and eat half of a Sicilian pizza with pepperoni (extra grease), and an order of two-dozen wings. I was more angry at the fact that I was not going to have that food as I ever was at not having a cigarette. Also, the smoking-related cravings have already stopped as of about a week ago. For those of you who don’t know me, I’m a relatively tall guy. Growing up, I was always able to rationalize eating as much as I wanted of whatever food I wanted because my weight never caught up to my height. In addition, I was an athlete, so I burned calories at a high rate. Then once my athletic career ended, I worked in construction and spent six to eight hours a day on my feet. All of those things allowed me to eat what I wanted with no consequences. It wasnt until twelve months ago that the issues I outline in my “About” page showed up. Then, it wasn’t until four weeks ago that I really started to take my health seriously. Twenty-seven years of stuffing one’s face is hard thing to quit! The benefits I’ve felt are really the only thing that stopped me from getting that pizza on the way home today. My energy level really is much higher with the increased servings of fruits and vegetable. On the day following a low fruit / veg day, I feel symptoms I can only equate to a food hangover. I feel tired, full, and mentally dull. Also, I’ve cut my coffee intake town to 0-2 cups per day, and have begun drinking 2-3 cups of green tea daily. This has eased my morning headaches and given me energy coffee never did. I laugh more, I sleep better, I enjoy small things that I never lent any weight to before… It really is amazing. Changing your diet opens you up to a new perspective of yourself. If you don’t believe me, try this. Go to your local market. Buy a handful of limes. Now, every morning for one week, sqeeze the juice of 1/2 of a lime into a glass of water each morning and have that as part of your morning routine before you reach for the coffee. Even the small addition of this shot of Vitamin C and a glass of water first thing in the morning made me feel more energetic and mentally sharper. The challenges I have undertaken have all been well worth it, even with the stress, frustration and agrivation that have gone along with them. If I wasn’t before, I am now certain that my wife is a saint for putting up with my through the last month. I understand that all of this is self imposed, and that any bitching about hunger that I may do can all be silenced with a trip down to Main Street. However, I am certain that with the help of my friends and family, I’ll be able to continue discovering a part of life that I was never interested (enlightened) enough to explore before. Thank you all for visiting my page and following my journey! It means more than you know. It’s been a little cool for Florida over the past few days. A few nights have gone down into the 40’s and 50’s here by the gulf. While it hurts my heart to say that I now consider this “cold”, it did make for a perfect excuse to making some more warm, homey dishes. 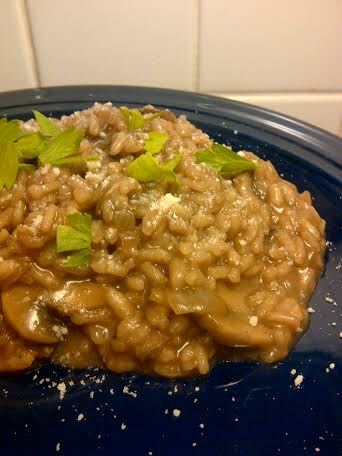 We’ve had some Arborio rice knocking around in the cabinet for a minute now, and we had a half of a container of white button mushrooms in the fridge… Risotto night! Many people, including myself until recently, are intimidated by risotto. It requires a special rice. You need to watch it constantly. You need to add just the right amount of liquid at just the right time. It’s temperamental and can easily come out still crunchy or as a bowl of cream of wheat. You get the picture. The truth is, if you have your mise en place and you keep your pairing / approach simplistic, this dish is extremely easy to prepare. Yes, this dish does require your attention. No, this is not a dish you can set-and-forget while you go about peeling, trimming and assembling an entire tray of micro-veg. Additionally, this is not a dish you should attempt to cook while your team is playing its top rival of the last five decades for that final playoff berth in the other room, or, while you are trying to catch up on the last week’s episode of “American Horror Story”. If you take your time to properly prepare your ingredients, plan or sequence all of the steps for your meal ahead of time, and put a little love into it, risotto can be an impressive recipe to add to your repertoire. Just make sure you have a playlist that you can leave alone for 45 minutes! Before your do anything else, get your stock into a sauce pan and get in on the stove. You need this to be steaming hot before you start your onions. As you go through the cooking process, if you add cool or cold stock, water or wine to your pan, you will shock the rice, and you will absolutely interrupt the cooking process which can lead to problems. Once the stock is on, prep your mushrooms, onions and garlic, then portion out the rice and wine. Now, heat 1 tbsp of EVOO in a large pan over med-high heat. Add your mushrooms and pinch of salt and saute until starting to brown. Remember, with mushrooms, if the pan is not hot enough or if you crowd the pan, you will wind up with steamed mushrooms… That said, if you need to cook the mushrooms one cup at a time, do so. 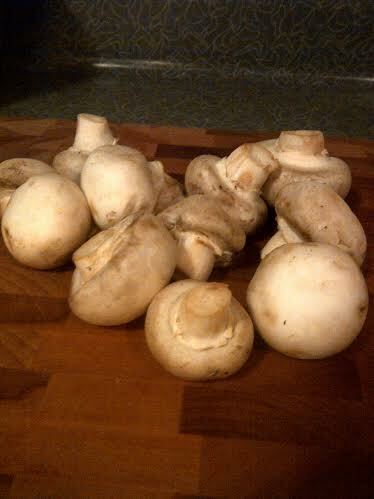 Once you get a color you are happy with, remove the mushrooms to plate with a paper towel and set them aside. You can either use a new pan, or clean and re-use the one you had the mushrooms in. Either way, this pan needs to be the largest you have. You are doing to want at least a 2″ – 3″ rim. Don’t forget, the 1 1/4 cups of rice will expand quite a bit, and you want the layer of rice to be as thin as possible in your pan throughout the whole cooking process. Bring your pan to medium heat and add the remaining 2 tbsp of EVOO. Add your onions and cook for 3 minutes, or until starting to turn translucent. Then, add your garlic and cook for another 2 minutes. You do NOT want the onions or garlic to take on any color, so watch them closely. About five minutes after you’ve started the onion, add the rice to the pan, stirring constantly for 1 minute. You need to stir the rice constantly because you do not want the rice to take on any color, and you also need to make sure that each grain of rice get coated in your EVOO and the oils from the onion and garlic. Getting them coated with fat will slow the release of their starch and will help ensure that you don’t end up with mush. After the rice has been on for 1 minute, add the wine and the first ladle of stock. Your stock should always be added at either 1/2 of 3/4 cup increments. This is not an exact science, so don’t stress about it. As long as you keep the rice wet but not drowning, you’ll be fine. Think of it this way: The rice needs to absorb liquid to expand and become tender (cook). You want to add just enough liquid so that the grains can ‘drink’, thereby absorbing the flavors you are adding to the pan. If you add too much liquid at once, the rice will not be able to absorb the flavor quickly enough and your liquid will start to simmer or boil. Now you are cooking the rice without the benefit of it absorbing flavor…. That’s the reason you want to take your time with risotto. You need to impart the flavor of the onion, garlic, leek, shallot, wine, stock, etc… into the rice. In some regions of Italy, risotto takes the place of pasta dishes. Think about the time and effort you put into your traditional red sauces… you want to put the same time and effort into this process. As the liquid is absorbed, add another ladle of stock to the pan. This process continues for up 30 minutes. As this is ongoing, it is crucial that your stir almost constantly. As you stir, you are accomplishing a few things. 1) you are making sure that all of the grains are getting the same amount of exposure to the stick as you add it. 2) you are creating friction between the grins which helps release the starches. The starch is what makes the risotto we all know and love so rich and creamy. Arborio rice has a higher starch content than other grains, which is why Arborio, in my opinion, is really the only rice to be used in a risotto (sorry, Baldo). Now, again, don’t stress out about the stirring. You have time to check get dishes organized, check on the other components of your meal, take photos for your blog, etc… as long as you are not leaving the rice sit for minutes at a time, you will be okay. After the rice has been on for approximately 15 minutes, add the mushrooms to the pan. Once these are stirred into the risotto, grab a spoon and check a few grains of rice for flavor and doneness. It will still have crunch to it, but it will give you a good benchmark as to how the dish has progressed over the last 15 minutes. Adjust seasoning as needed and continue with the stock-and-stir. After about 25 minutes of total cook time, it’s time for the spoon test. 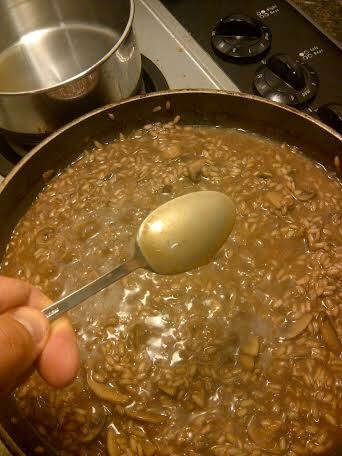 Take a clean spoon and, without pushing down on it, drag it across the top of your risotto. Check the bottom of the spoon. If you have a nice, creamy coating on the bottom of the spoon, you’ve done good work. 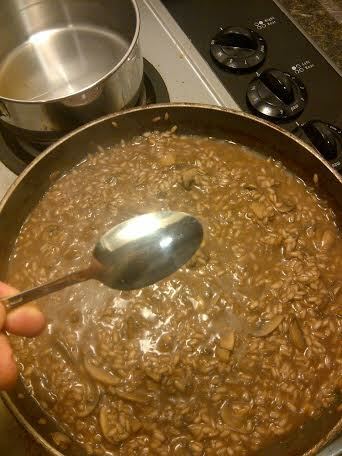 Continue to taste your risotto, checking for doneness, until you’ve reached your preferred level of al dente. For The Love Of All That Is Holy, Do Not Cook Until Soft And Mushy. You’ve invested too much love and effort into this to eat it any other way than how it was meant to be eaten… Once done, remove from the heat and add 2 tbsp of pecorino romano, stirring to incorporate. Serve hot (within a few minutes of removing it from the heat), spooning the desired amount onto plates and garnish with parsley and another pinch of cheese. 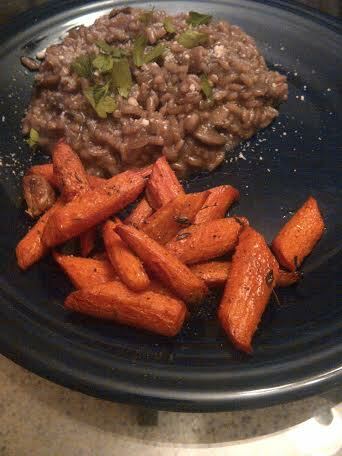 I paired this risotto with some simple roasted carrots, tossed with EVOO, salt and pepper, a few whole garlic cloves and a few sprigs of thyme. Left in the oven at 350 F for 25-30 minutes. (prepped these prior to starting the risotto). As far as nutrition goes,the Arborio rice is not going to hurt you. With no fat to speak of, and as a good source of protein and dietary fiber, it’s not a bad choice for a side or a main. You will need to be careful about what you add to it. EVOO should be used sparingly. Most recipes you will see call for copious amounts of butter to be used. Obviously, I cut that out. Constantly stirring the rice, as well as adding the cheese at the end will give you the creaminess you are looking for. The vegetables and stocks you use in your risotto will make not only a big difference in your flavor, but in nutrition. Try risotto with vegetable stock and one of your favorite vegetables and see what you think! Be careful though, as fresher vegetables like peppers or peas should not be added until the last few minutes of cooking in order prevent them from breaking down. I hope you make some room in your schedule one night soon and devote some time to making this. Forget that 5-minute rice in a box for a night, and roll your sleeves up. Taking the time to make this dish is relaxing as well as rewarding. Trust me, you’ll taste the love in it when you do it right. So, it’s late morning on a Sunday. Yesterday, you knocked out all of your chores for the weekend. The house is clean, the shopping is done for the week, the laundry is done (less the folding, because I’m fairly certain no one washes, dries AND folds their laundry all on the same day), and now, your Sunday can be devoted to whatever your heart desires. One problem; you may or may not have caved yesterday while at the store when you came face to face with a buy one, get one free deal on those wonderfully salty corn tortilla chips….the bite-size ones. With the Sunday “off”, those bags are now sitting in one of your cabinets, softly calling your name. The good news is, you were able to walk by the display of buy one, get one free queso cheese dips that were only 8″ away from where the chips were. Nice Work. Still, you need to find something to pair with those chips that will help fill you up, because even though they give a “serving size” on the package, it’s impossible to read it without bursting into laughter. I’m personally not a huge fan of canned foods. When I do buy them, I look for organic products, non-GMO, and packed with just salt and water. When I find these, regardless of the product, I usually grab a few cans and sock them away in the pantry. Today, that’s turned out to be a good practice. I took what I’ve saved in the pantry, plus what I had hanging on in the garden despite the cold-snap of the last few days, and here is what we have. I’ll call it a salad because it’s very good as a stand alone, but today, I have a date with those corn chips. Except for the lime, combine all of the above ingredients in a large bowl. Cover, and place in the fridge for at least 30 minutes to let all of the flavors meld. Once ready to serve, cut the lime into wedges and serve of the side so everyone can add their own splash of freshness. This salad (or dip) is packed with proteins. Also, black eyed peas, as with almost all legumes, are a great source of fiber. One serving of these can contain as much as 16% of your DV. Not only is fiber great for digestion and heart health, but it will also keep you feeling fuller, longer. Not a bad thing for a Sunday during football season!